Make the Butterscotch Sauce: In a heavy bottomed saucepan, combine butter, brown sugar, salt and ¼cup of light cream. Place on medium flame and cook, stirring continuously, until the butter has melted and sugar dissolves to form a smooth mixture. Stop stirring, reduce the fame and allow the mixture to simmer for 2~3 minutes. Turn off the heat and stir in the remaining light cream. Let the mixture cool completely, transfer to a clean jar and store the sauce in the refrigerator. It needs to be reheated on low heat for a few minutes to loosen the consistency. 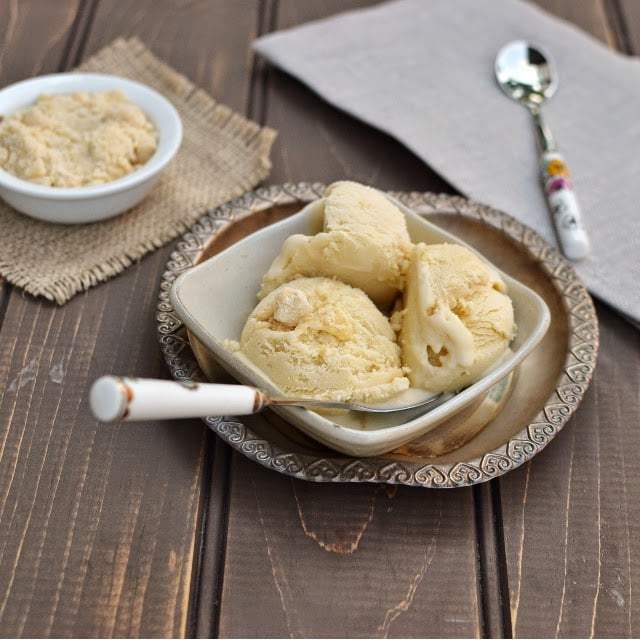 Make the ice cream: Mix corn starch with ¼cup of milk in a small bowl and set aside. Add the remaining milk and heavy cream in a large sauce pan. Bring the mixture to a boil and cook on moderate heat for about 4 minutes. Turn off the heat. Gradually whisk in the corn starch mixture. Return to boil and cook on moderately high heat until the mixture thickens a little bit, between 1-2 minutes. Remove from heat and let cool. Once the mixture is slightly cooled add the vanilla extract. Once the mixture is completely cooled, add the butterscotch sauce and mix well. Start by adding about 1¼cup of butterscotch sauce, taste and see if it needs more sweetness. I ended up adding ALL of the butterscotch sauce because we have big sweet tooth, but if you are not, then start with less and add more as needed. Chill the mixture for at least 3-4 hours or overnight. Once thoroughly chilled follow your ice cream machine instructions to make the ice cream. Sprinkle with almond praline and Enjoy!! Remove from the heat and quickly stir in the nuts, vanilla and salt. Spread quickly on a baking sheet with a spatula. Let cool completely, then break it and use as needed.